2016 has been a fast-paced and exciting year for us, we have been super busy all year round and have only just come up for air now! From Scotland and Ireland to Exeter and Liverpool, we’ve travelled a lot and carried out work we’re very pleased with. 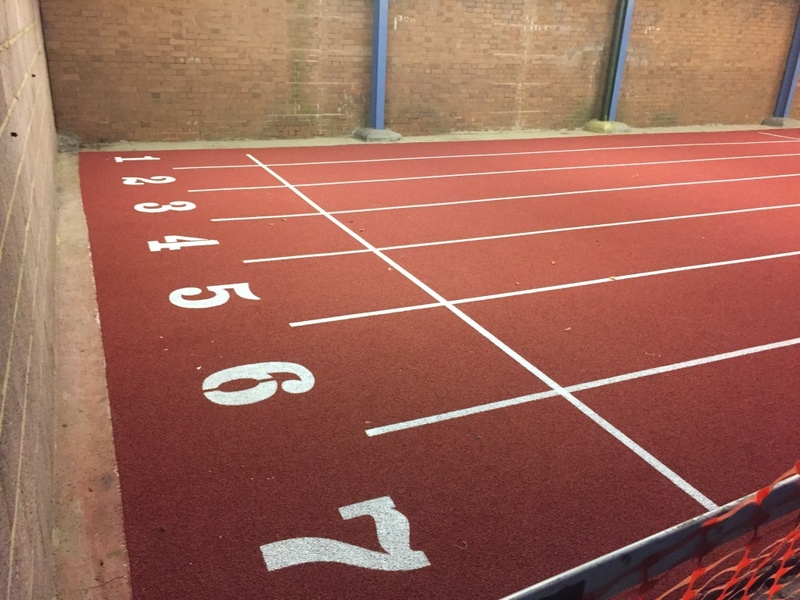 Some of the exciting projects from 2016 include school track washes and remarks such as Radley College and line marking at the Chelsea Academy Football ground. The athletic tracks we have worked on this year include Gateshead Stadium, Scotstoun, Ellesmere Port and the Queen Elizabeth Stadium, London. 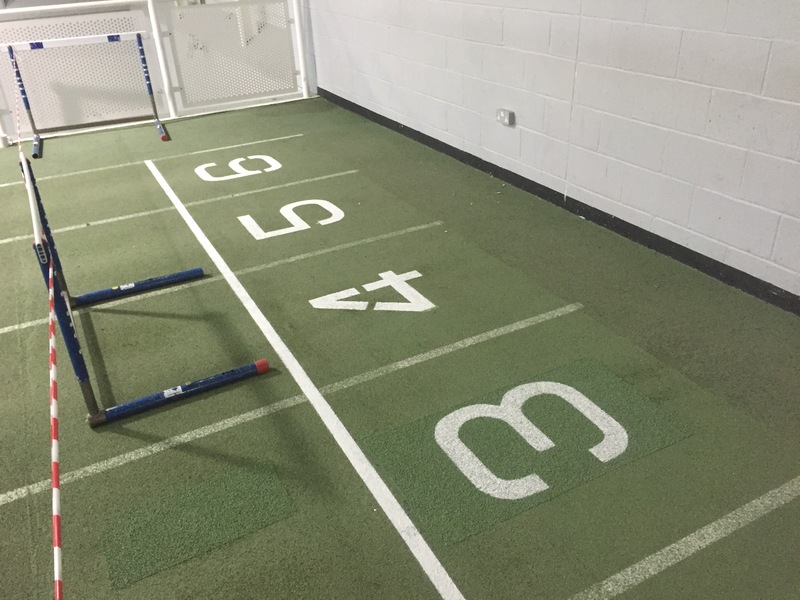 We’ve also done several indoor sports halls and a number of mini sprint tracks in gyms across the UK. The work this year on athletic tracks has ranged from repairs and resurfacing work on tracks including Ellesmere Port, washes and remarks and sometimes just simple repairs. We have surveyed and painted new tracks both indoors and outdoors. 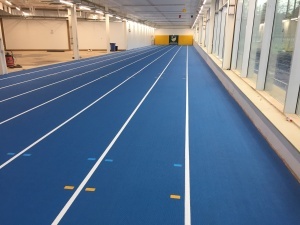 Nottingham University was an example of one of the indoor tracks surveyed and painted by us this year. We’ve worked abroad a few times in Holland and Norway with hopes to travel further afield too in 2017. We are now taking books for the summer of 2017 and the calendar is slowly filling up. We’re looking forward to making lots more happy customers this year and wish you all a Happy New Year. This entry was posted in blog and tagged Athletic Track, High Pressure Cleaning, Indoor Sports Court, indoor sports surface, Running Track, sprint track, Surface Repairs, Track Maintenance, Track Remark, White Line Services on January 4, 2017 by Marc Adams. We’re abroad again and this time we’re line marking in Norway. This week, we are working on 2 tracks in Norway. 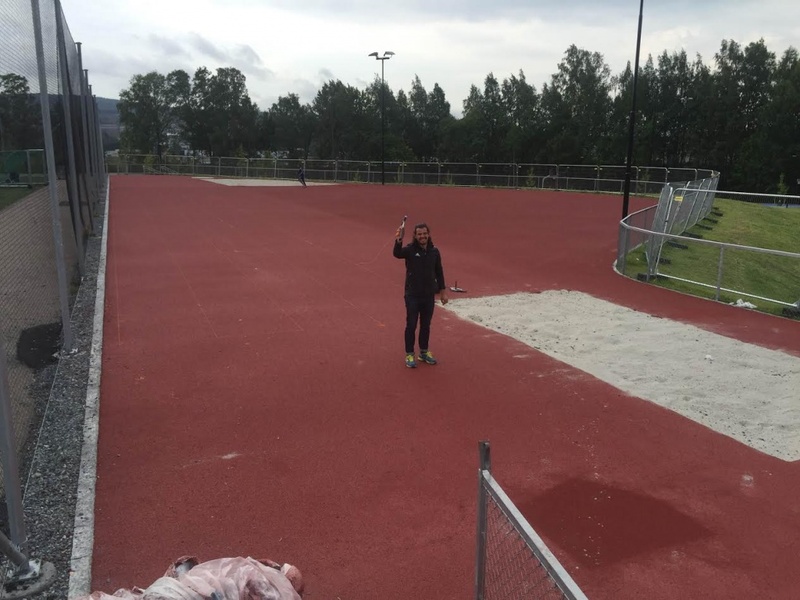 The first is a 200m track near Drammen, Norway. 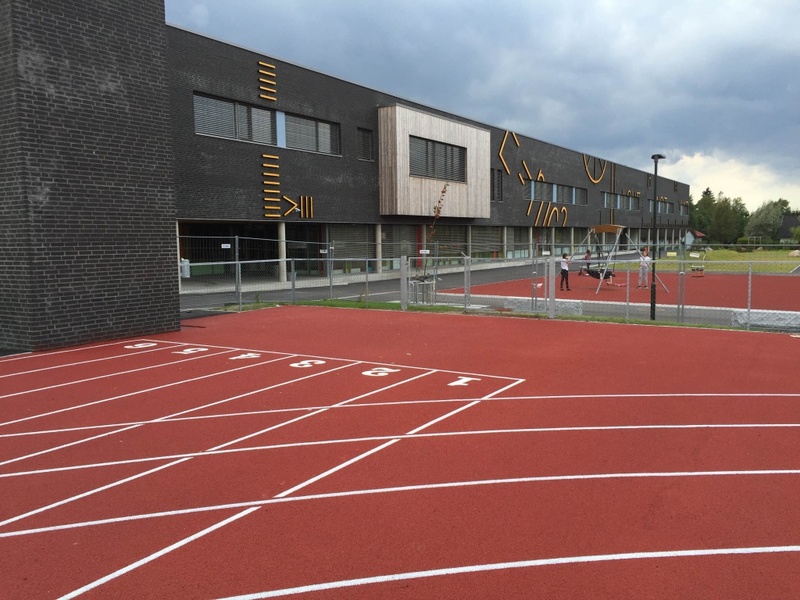 The track is at Veitvet Skole located outside of Oslo, with fitness equipment on the inside of the track. After 3 days, the first track is complete, as you can see in the image below. Now, onto the second slightly smaller track, 4 lane 60m sprint track with a long jump. Here is Visar Jusufi, setting up ready to begin painting. And here is the complete track. Last job starting tomorrow, lets hope the sun shines for us! 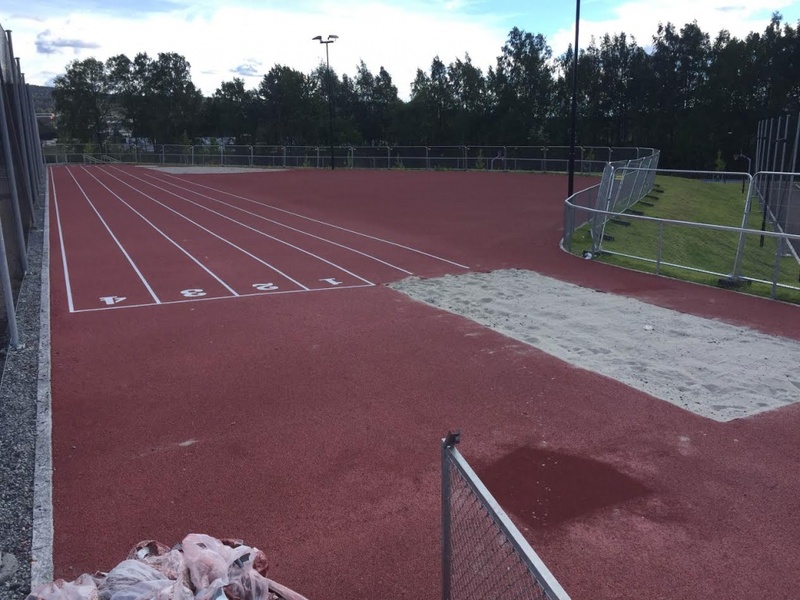 This entry was posted in blog, Norway and tagged Athletic Track Line Painting, Running Track, sprint track on September 1, 2016 by Marc Adams. The David Weir Leisure Centre (which used to be known as Sutton Arena) is named after the British Paralympic wheelchair athlete David Russell Weir. David Russell Weir has won a total of six gold medals dating from 2008 to 2012. Not to mention winning the London Marathon on six different occasions. Born in the London borough of Sutton, it seems apt for a leisure centre and athletic track in Sutton to be named after this sporting superstar. David Weir Leisure Centre, run by Everyone Active, has both an indoor 6 Lane sprint track and an outdoor 8 Lane 400m track plus Pole Vault, High Jump, Throwing Cage, Javelin, Shot Putt and 2 Jump Pits. 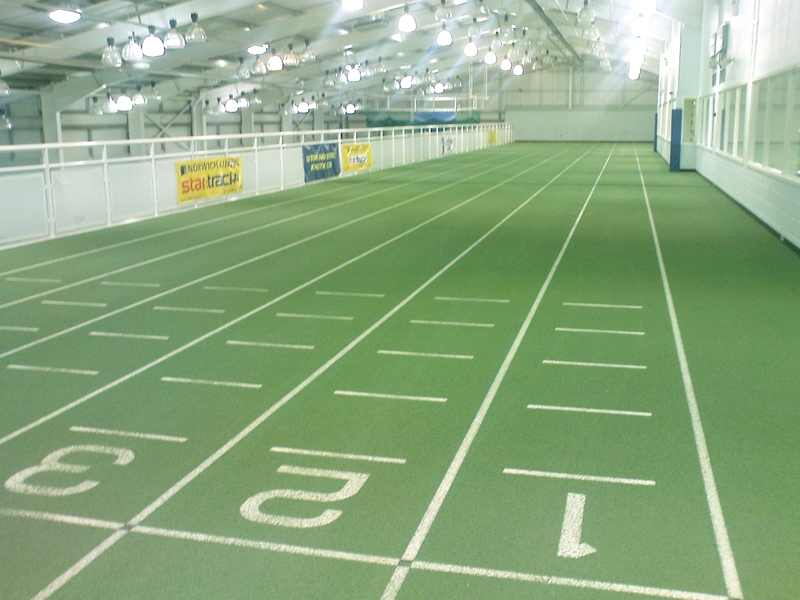 The indoor 60m sprint track provides athletes with the ideal winter training facilities. The track itself is a 60m track with a 22m run off. There is also a pole vault, high jump, throwing cage and 2 jump pitts. 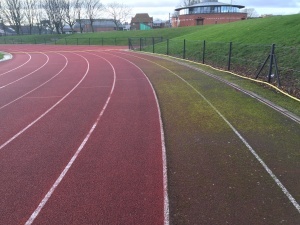 Below you can see our recent repair work to lane 3 of the indoor track which is barely visible now that the repair has been matched to the surrounding green synthetic track surface. 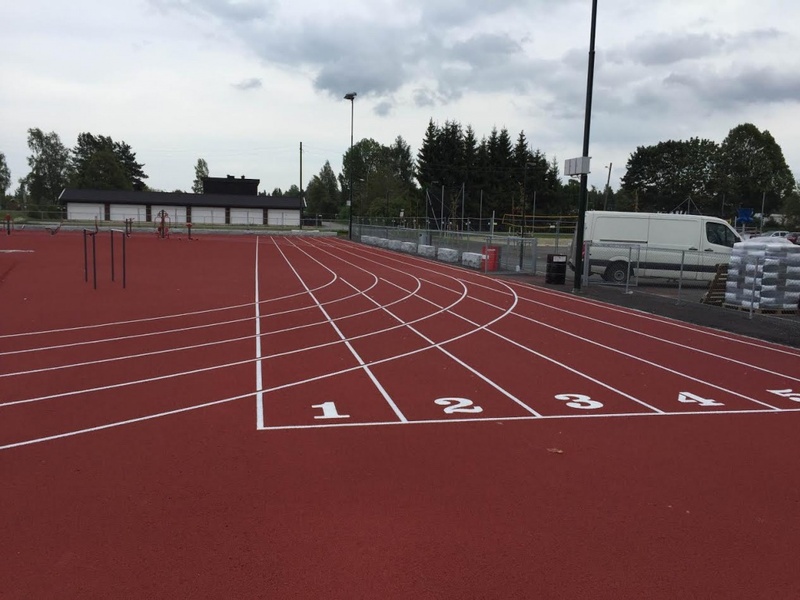 This entry was posted in blog and tagged Athletic Track, indoor sports surface, Running Track, Surface Maintenance, Surface Repairs, Track Maintenance, White Line Services on April 13, 2016 by Marc Adams. Last week, our team were at Radley College in Oxfordshire, washing their 400m athletic track. The track itself was covered in moss and lichen, making it very slippery and in need of some TLC. The machinery we use to clean the track, cleans at force to ensure that all moss and particularly lichen is high pressure cleaned off the surface. In this picture, you can see our team have cleaned the track in one path revealing the lovely red track that’s been hidden below. On half of the above picture, you can see the pre-washed track with the remaining green moss and lichen and on the other side, you can see the track has been restored back to its former glory. The running track is now completely moss free and ready for the summer term athletic season to begin. This entry was posted in blog and tagged Athletic Track, Featured, High Pressure Cleaning, Running Track on February 17, 2016 by Marc Adams. The Linford Christie athletic stadium is an all-weather 8-lane 400-metre track. There are two 8 lane 100-metre straights plus athletic field areas including high jump, long jump etc. Named after the former British 100m Olympic gold medalist, the Linford Christie stadium is located in West London. 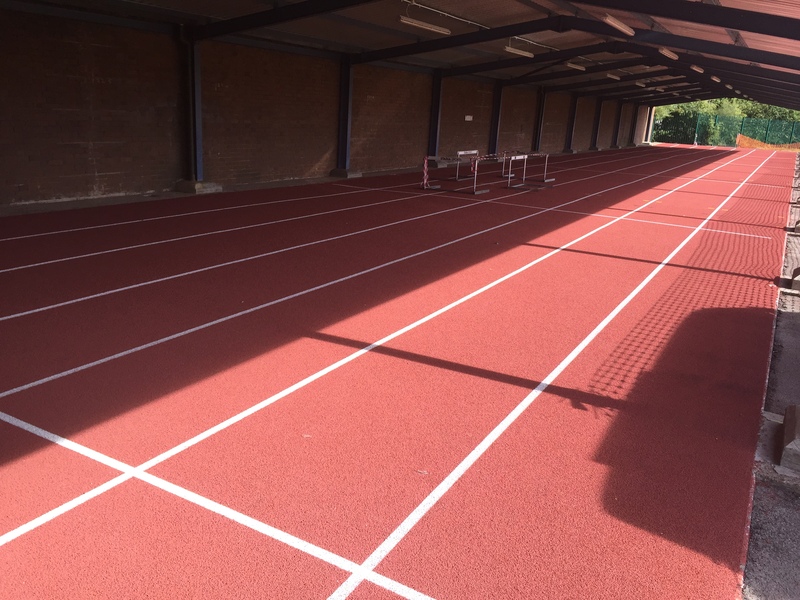 Home to one of the UK’s top athletics clubs, the Thames Valley Harriers, this London based athletic track provides London with a great home for training and hosting sporting events. 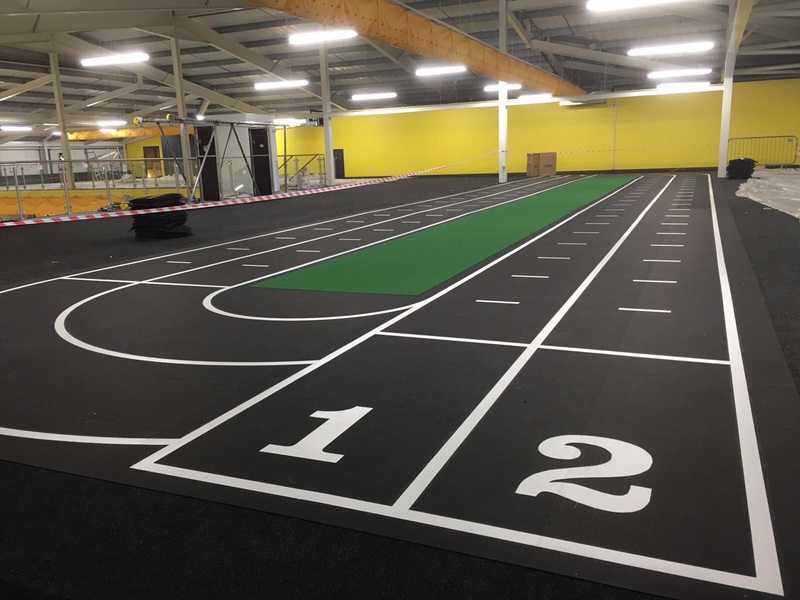 In 2015, White Line Services relaid, resprayed and repainted the indoor sprint track. There was also work carried out to replace the base layer of the track and install new kerb stones around the edge. To view some of the other projects White Line Services have carried out in the UK and across the world, visit our website. 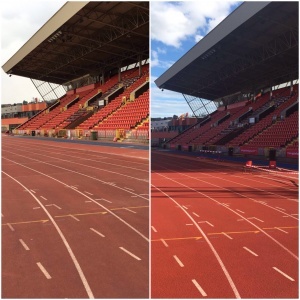 This entry was posted in blog and tagged Athletic Track, Athletic Track Line Painting, London, Running Track, Surface Maintenance, Surface Repairs, White Line Services on January 21, 2016 by Marc Adams. Maintenance is so important for the overall up keep of your athletic tracks and sports surfaces. By having White Line Services give your sports surface a high-pressure clean will remove any dirt, grime and contaminants including most weeds and moss, leaving your surface in prime condition for your next events. Our AquaVac mobile cleaning machines are fully equipped with a high-pressure water pump which cleans using pressures in excess of 2000 PSI. The machines clean 4ft (1.22m) at a time making them perfect for cleaning a full lane width at a time. The finished product will have no overlapping marks, spray marks or wobbly lines, and we guarantee you will be pleased with the finished result. The AquaVac is also designed to collect and dispose of any dirty water, by vacuuming it off the surface and pumping it away down the drain. We collect and dispose of all dirty water and we won’t leave site until you are entirely happy with the quality of your clean. The machines are compact so we can easily clean both indoor and outdoor sports facilities. 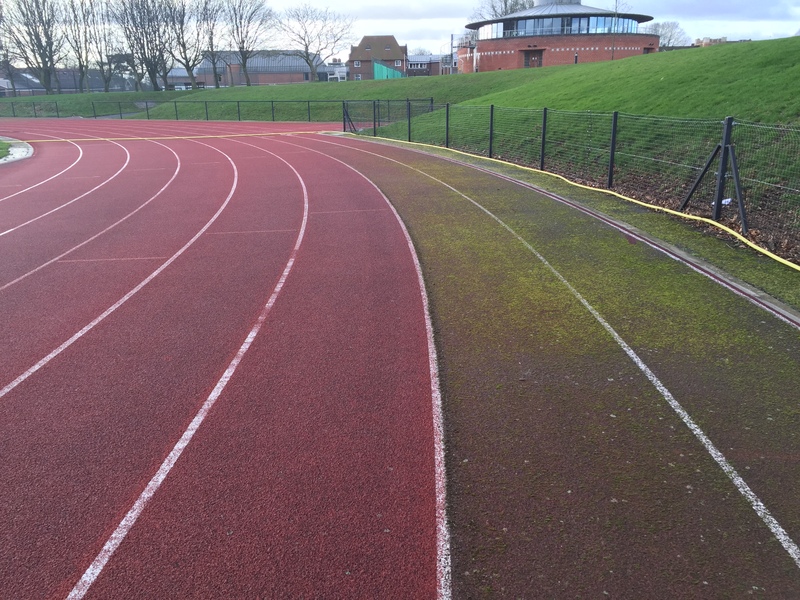 By having your track cleaned every year or two will ensure that any dirt and grime doesn’t cause major damage to your track and sports courts which over time would be very costly. Here you can see our high-pressure machine in action, cleaning a full lane width at a time. This entry was posted in blog and tagged Athletic Track, High Pressure Cleaning, Running Track, Surface Maintenance, Track Maintenance, White Line Services on January 14, 2016 by Marc Adams. Lee Valley is a favourite of ours among the great tracks in the UK. 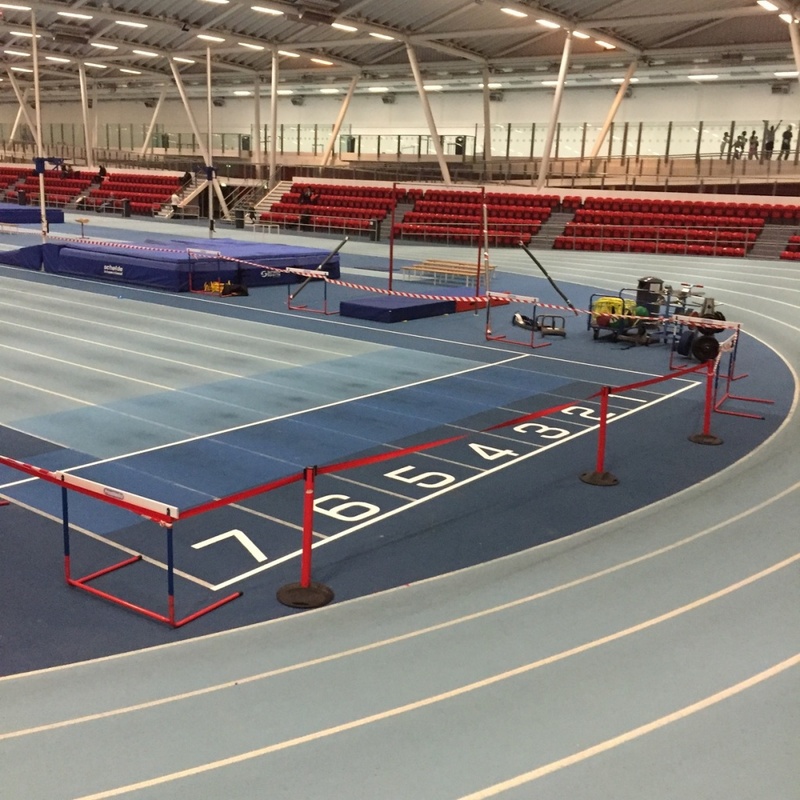 The centre itself holds the largest indoor and outdoor athletic facilities serving London and South East England, making it an important sports site for athletes of all levels. The centre trained gold medallists like Greg Rutherford and Jonnie Peacock for London 2012. 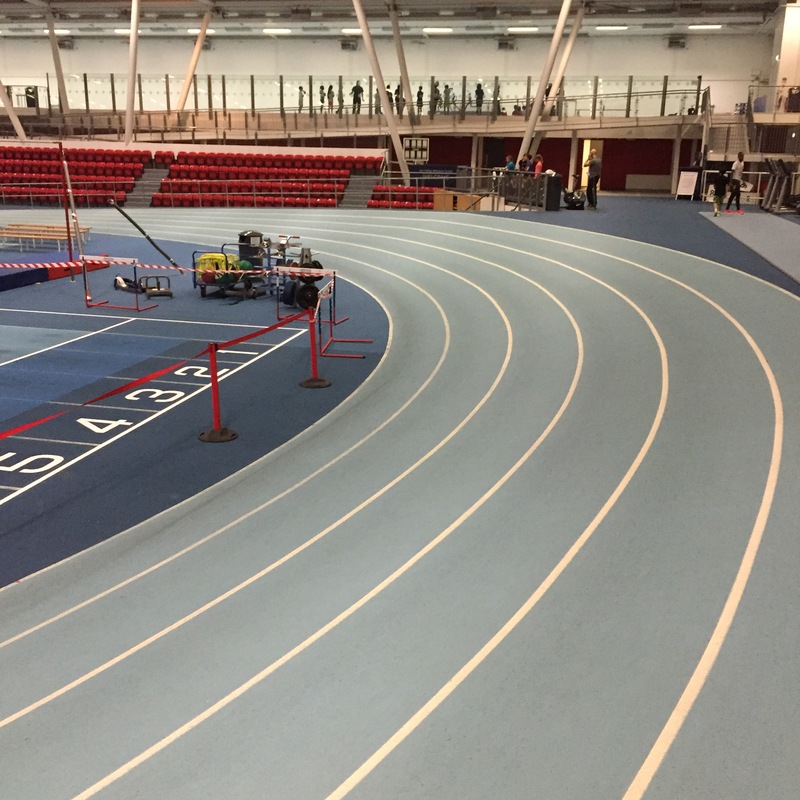 With a unique blue indoor sprint track, you would easily be able to recognise Lee Valley’s indoor track. The indoor track has a capacity to hold 500 spectators to view athletics on their 130m and 60m sprint straights and 200m circular track. Being the only indoor 200 metre 6 lane track in the whole of the South of England, the facilities are highly respected by athletes in and around London and the South. 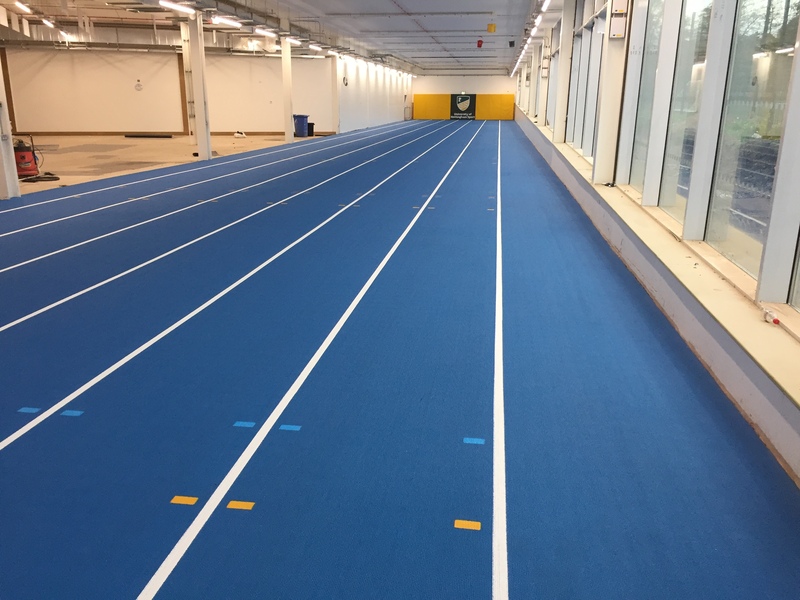 Recently, White Line Services have carried out work on the 60m sprint part of the track, including remarking and surveying and painting an eighth lane to the 60m track. The outdoor track offers a 400m, 8 lane track with a 600m bark trail available too. Recently, White Line Services have carried out full depth and top surface level repairs to the outdoor track using IAAF certified materials. To follow the work we do across the UK and the rest of the world, follow us on Facebook and Twitter @whitelineserv. 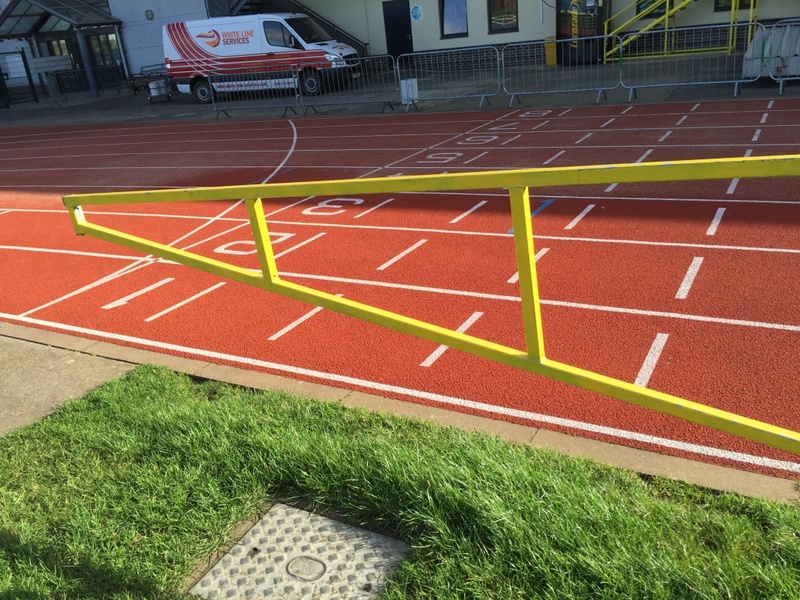 This entry was posted in blog and tagged Athletic Centre, Athletic Track, Featured, London, Running Track, White Line Services on December 14, 2015 by wladmin.